The latest watercolor painted one-sheet for The Wolverine carries on the tradition of the sumi-e ink campaign created by Fox's Chief Creative Officer Tony Sella. 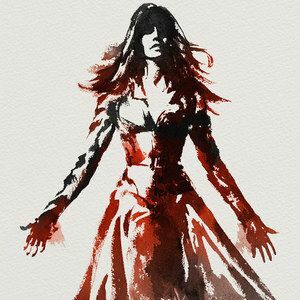 Here, we see Jean Grey, played by Famke Janssen, whose ghost will guide Logan (Hugh Jackman) on his journey through Japan. Check it out, and then read on for comments from director James Mangold, who reassures comic book fans that this adventure is purely a standalone story with no ties to the upcoming X-Men: Days of Future Past. And like a proper one-off, it has a beginning, middle, and definitive ending. The Wolverine has long been rumored to contain a post-credit stinger that reveals Patrick Stewart as Professor X coming to retrieve Logan at the airport, which will lead directly into the release of next summer's X-Men: Days of Future Past. While director James Mangold doesn't deny this, he wants to make it clear to fans who might be disappointed come opening night that the two films have nothing in common, and are not tied together in any way. As stated before, The Wolverine takes place years after every movie in the franchise, including X-Men: Days of Future Past, at a time when all of the Mutants we now know are dead and buried. "[X-Men: Days of Future Past Director] Bryan [Singer] and I have talked and he's seen what we've done. Clearly the reality is that we are all trying to work together and make things groove together. But the trick is we were making our movie before Bryan came on and before I knew what they were up to in that film. Our agenda was always our agenda and our movie stands alone, so the journey we take Logan on in The Wolverine, we bring to a close." That said, its likely that there will still be a post credit stinger. It's just that the two films will not be tied together within their story structure, and like we see with some of the Jean Grey footage, this rumored cookie will serve as a flashback.